The tuxedo urchin is often overlooked by many new aquarists. It is not one of the primary mentions for your clean-up crew, nor is it making any great beginner fish list. When you get down to it though if you have a fairly established aquarium, say 9-12 months or more, this is one of the best algae eaters you can add. Blue tuxedo urchin from Captive Aquatic Ecosystems, LLC. on Vimeo. Where is the Tuxedo Urchin Found? Are Tuxedo Urchin reef safe? What do Tuxedo Urchin eat? What type of behavior can you expect from a Tuxedo Urchin? How do Tuxedo Urchins reproduce? What are some good Tank Mates for the Tuxedo Urchin? What is the Lifespan of a Tuxedo Urchin? What Tank size is recommended for the Tuxedo Urchin? The Tuxedo Urchin is most commonly found in the tropical waters of the Indo-Pacific. This region is home to many creatures commonly kept in reef aquarium. Yes, Tuxedo Urchins are completely reef safe. These urchins are very hardy and easy to care for so long as you are familiar with their habits and diet. They remain small enough that they do not act like little bull dozers moving everything around your tank. They will however move small objects around and place things on their head for camouflage. 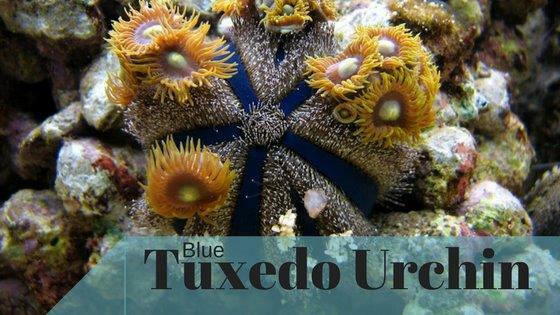 That is where the name tuxedo urchin came from since the items it places on its back are like it putting on its top hat. Tuxedo Urchins diet consists of algae. They have been reported to be nocturnal hunters. This is most likely a safety precaution to avoid predators in the wild. Many aquarists have stated this does not seem to be the case in the aquarium and they can be seen wandering the tank eating algae all day long. They will graze on almost all types of algae including hair algae and also coralline. This is why these are only recommended for a mature tank. That being a tank that has sufficient algae, both nuisance and coralline. They are veracious eaters and though they could tackle an outbreak situation often seen in newer tanks it is not recommended as their food source will quickly die off. If there is not enough natural algae growth in the tank they can be spot feed algae sheets. The urchin will attach this to its back and use its feet to pull portions off to eat over time. The problem with this is that the urchin will then look like a moving buffet table to your fish. Your fish may then torment the urchin, trying to go after the algae sheet, even with the urchin’s spikes. So, though it can be spot feed, this is why a mature tank is recommended. Amazing!! Blue tuxedo urchin on YouTube. Urchins like with other invertebrates require extra special care when acclimating, since they are more easily impacted by sudden water condition changes. Like all invertebrates a long drip acclimation is recommended. I would actually recommend letting these drip for about 2 hours. 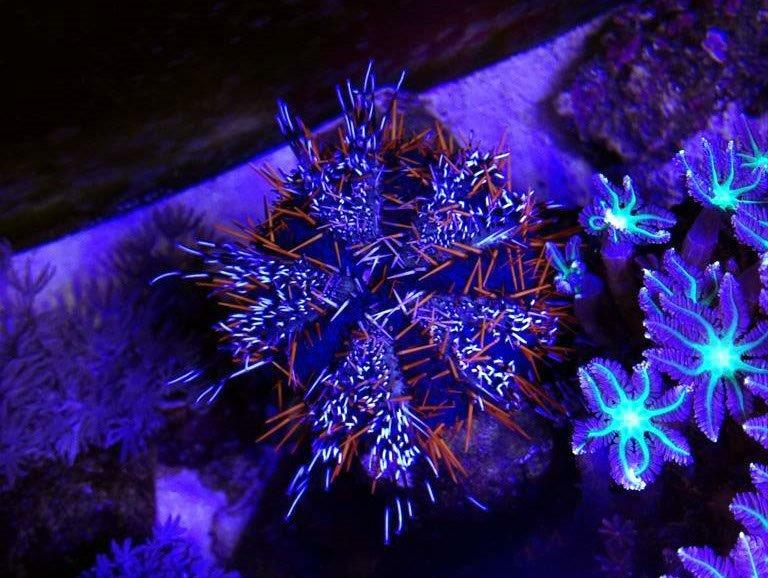 When moving your urchin to your tank, it is best to do so without fully removing it from the water. Place the bag or bucket into the tank and allow the star to enter the tank w/out being exposed to air. Tuxedo Urchins are an interesting creature. They will move around the tank continuously searching out food. They will climb any and everything including the glass. Since they only get about 3” in diameter though they will not bulldoze around any large rockwork. They can however move small things around. One of the most interesting behaviors these guys have is how they will try to camouflage themselves. They will pick up small items around the tank and hook them to the spines on their back. They have been known to break loose small mushrooms and clusters of zooanthid polyps. 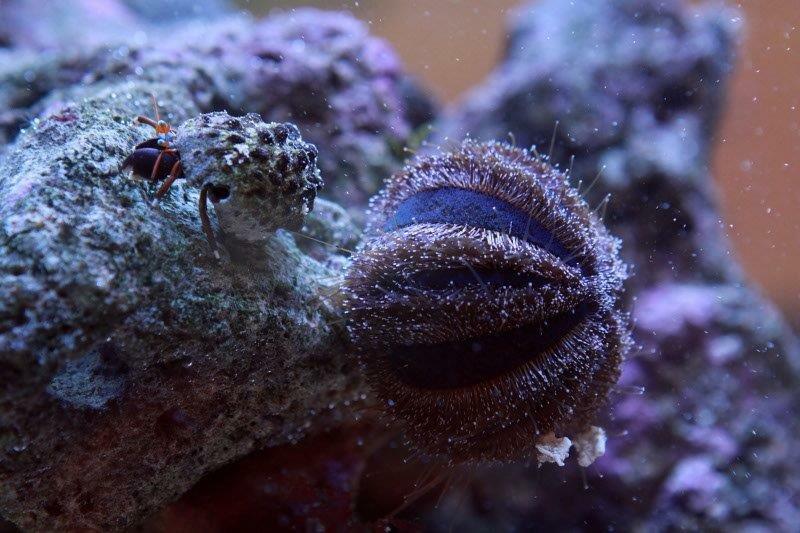 Seeing a urchin crawling around with a thriving zoa colony on its back is a pretty awesome site. Tuxedo Urchins like most urchins breed by releasing sperm and eggs into the water. Their natural spawning season is spring time. If within proximity of each other when this happens the eggs are fertilized and will float within the water column for several months until hatched. Once hatched the young urchins will slowly grow to adulthood. The sea urchin does not grow very fast, the larva will float along in the water with the phytoplankton up to two years or more. Once large enough they will drop down the sea floor as what we typically visualize as an urchin. 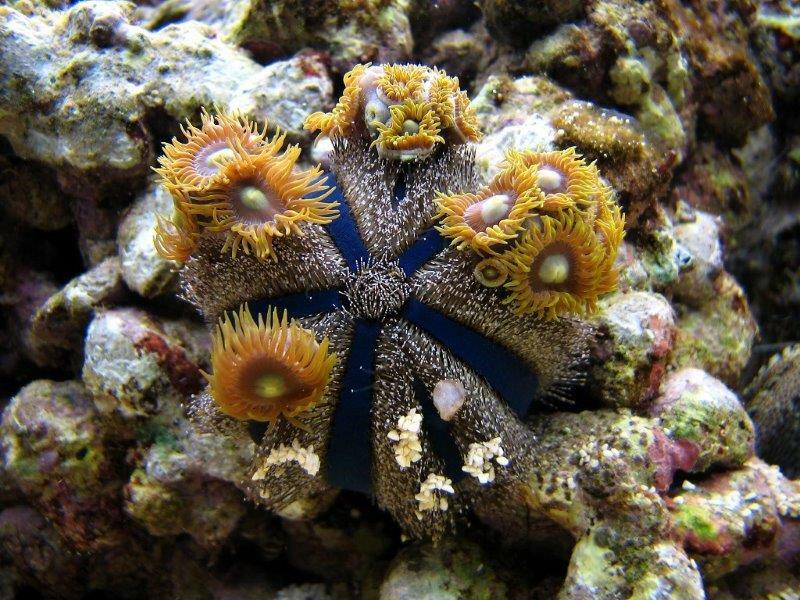 Because of the proximity factor, breeding in the wild often happens successfully when many urchins are in a centralized location. Due to this w/out a tank stocked specifically to breed them, captive breed urchins are not common place. FarmerTy – Female Tuxedo Urchin Spawning from FarmerTy on Vimeo. 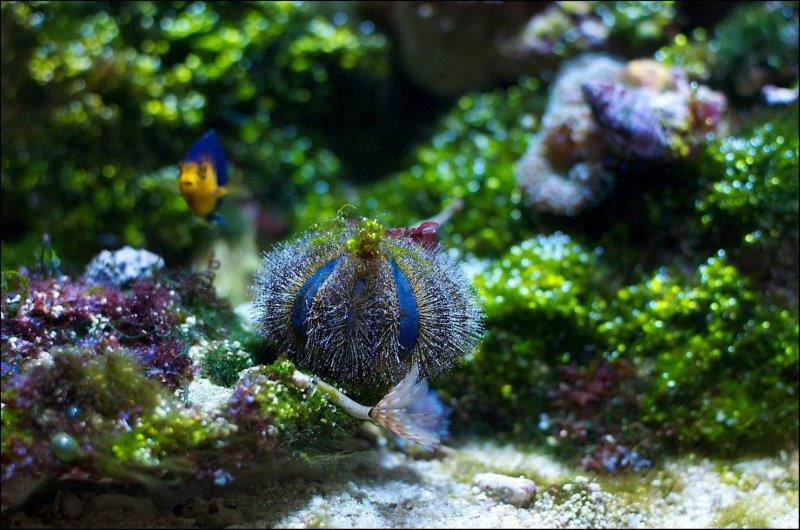 The tuxedo urchin is reef safe and can be kept with most marine fish commonly sold in the hobby. Their spines make them safe to keep with most of your more aggressive fish and will be left alone after the first prick or two. Animals such as large crabs and fish not typically kept in home aquariums, sea otters, birds, and us humans are the main predators of the urchin. So unless you have a very unique tank or extremely uncommon tank placement most things you find at your local fish store or fish website are safe. Tuxedo Urchins have been documented as living 5 or more years in an aquarium. Since they will live in their larva stage for 2-5 years floating with the phytoplankton before being aquarium ready; that puts their typical life span at around 7-10 years. I have seen recommendations as small as 20 gallons. The problem I see with that is the food supply. Although you can feed a tuxedo urchin with seaweed sheets, I would rather have them living in a tank that has a natural food supply in more abundance. A 20 gallon aquarium would not be able to grow enough algae to sustain an urchin. I would recommend a 40-60 gallon tank minimum and would still attach an algae sheet to their back every week or so. The most common coloration is the blue tuxedo, which is blue in the center with tan to brown pines sticking out of it. Other variations you will see are the red tuxedo, which can still have a blue center but will have red spines extruding from it. There are also color variants in between these two as well as those with more muted tans and browns which really dull down the blues and reds. The Tuxedo Urchin is not poisonous like its long spine cousins. Caution should still be taken when handling since they do still have spines that can poke and prick your skin which if not cleaned can lead to infection. If you are looking for something new for your established tank or need to replenish your clean up crew but don’t want to just add more snails; The tuxedo may be the perfect solution. What is your experience with this urchin? Let me know in the comments below.